Michelle is the designer behind Two Brothers Blankets! She lives in Florida with her husband, two sons, and two dogs. 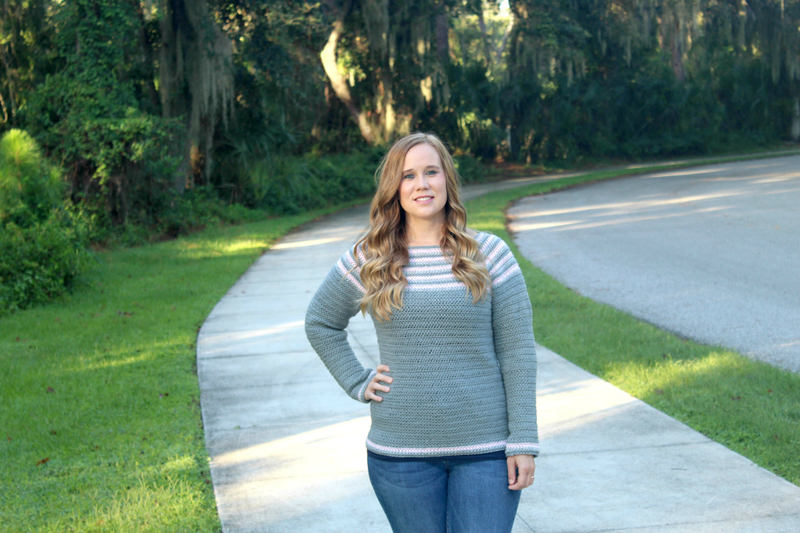 When she's not crocheting, she loves going to the beach, watching football, and reading. Hi makers! My name is Michelle Ferguson. I am the designer and creator of Two Brothers Blankets! When I was a young girl I would watch my grandmother crochet these huge afghans and admired the beautiful work she did every time I went to visit her. Fast forward 20 years, and I decided to try to learn crochet myself. What was meant to be just a fun way to make things for my kids became an all-out passion! I’ve been designing and writing crochet patterns for almost 5 years now. I love to design garments, especially for women. 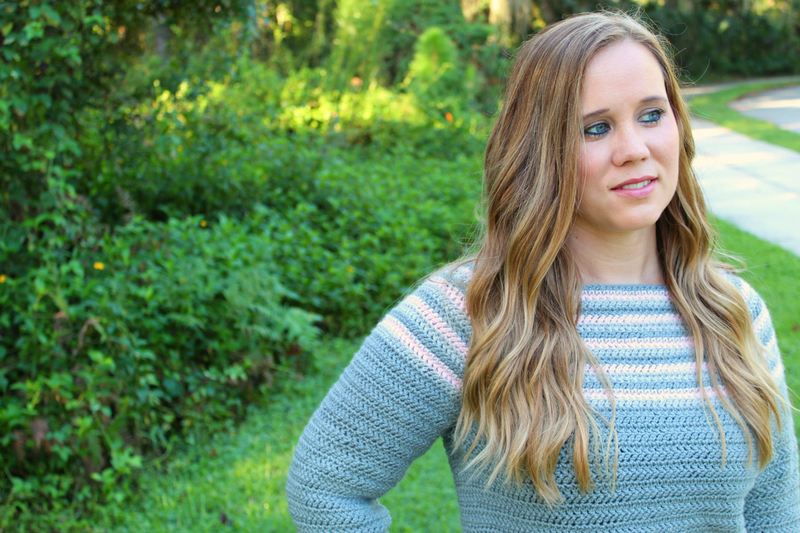 I love creating modern, stylish, and cute crochet clothing. There is nothing that gives me more pride than to be able to tell someone that I made the top I’m wearing! 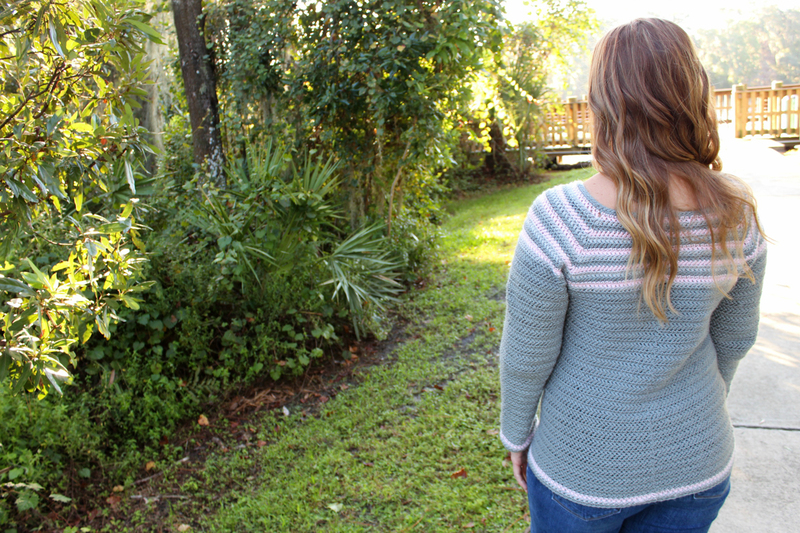 I’m excited to share with you a new garment crochet pattern of mine - the Remi Raglan Sweater! herr-dc- herringbone double crochet- yarn over, insert hook into stitch, yarn over, pull through stitch and one loop, yarn over, pull through one loop, yarn over, pull through both loops. herr-dc2tog- herringbone double crochet 2 together- yarn over, insert hook into st, yarn over, pull through st and 1st loop (2 loops on hook), yarn over, pull through 1 loop (2 loops on hook), yarn over, insert hook into next st, yarn over, pull through st and 1st loop (3 loops on hook), yarn over, pull through 1 loop (3 loops on hook), yarn over, pull through all 3 loops. Garment has 1” positive ease to it. Starting chain does not count as first stitch unless stated otherwise within the pattern. Sleeves are written in smallest size with additional sizes in parentheses. Final stitch count for all sizes are in parentheses at the end of each round. Start with the MC and switch colors each round. Ch 100. Being careful not to twist, join to 1st st.
Repeat round 17 until garment is 21” or desired length. Switch colors each round for the next 3 rounds, ending with your main color. Fasten off. Move on to sleeves. Repeat round 19 until garment is 21” or desired length. Repeat round 21 until garment is 21” long or to desired length. Repeat round 23 until garment is 22” long or to desired length. Repeat round 25 until garment is 22” long or to desired length. Repeat round 27 until garment is 23” or to desired length. Repeat round 29 until garment is 23” or to desired length. With MC, join yarn to 1st st of armhole, with WS facing. Fasten off. Weave in ends. Block if necessary. 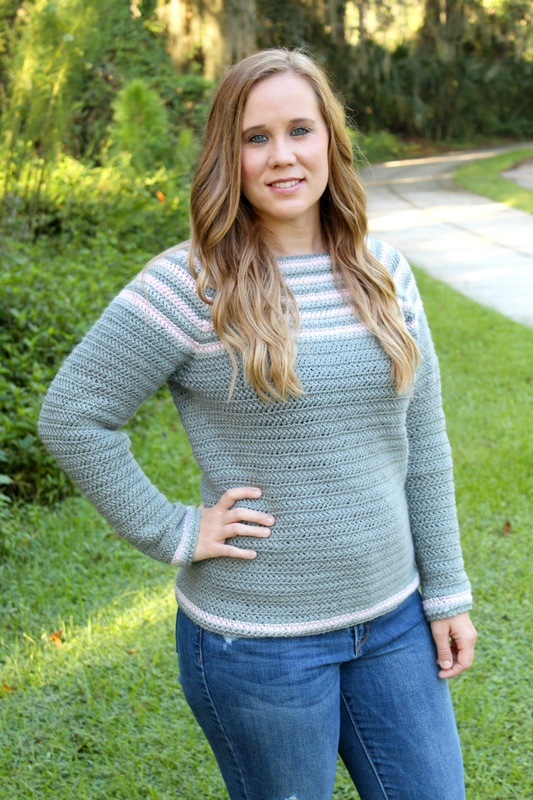 Thank you to The Hook Nook Blog for this wonderful opportunity to share my pattern on this platform! To everyone reading this, if you make this sweater, I would love to see your photos so be sure to share them on Facebook or Instagram and tag Two Brothers Blankets and The Hook Nook, so we can see your work! If you have any questions or comments, please leave them in the comments below.